Natural South Sea Pearls -- Have You Found One? Natural South Sea pearls are without a doubt some of the most fabulously beautiful objects on this earth. I took this photo while I was in that area of the world recently. They are the ultimate in pearl luxury....at least in my opinion. Have you had the honor of finding a natural pearl from that part of the world? If so, I invite you to share a photo or even a video of your pearl and tell your story. Have You Found A Natural South Sea Pearl? Do you have a great story about finding natural South Sea Pearls? Share it! Natural South Sea pearls are among the most treasured items in our modern world. If you have been fortunate enough to find one, others would love hearing about it and seeing a photo. Do you know what sort of Pearls these are? Found this necklace in Australia, given to me by an older lady. She doesn't know much about them but has had them for 30 years. Go to the main finding a pearl page after South Sea pearls. 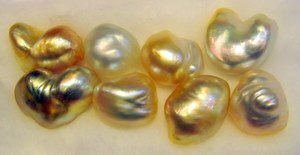 Learn more about natural pearls. I promise to use it only to send you Pearls of Wisdom.